Jason Michael Carrol performs at Bootlegger’s on June 21. Whether it's Kenny Chesney or Brad Paisley; Willie Nelson or Kacey Musgraves; Sturgill Simpson or Miranda Lambert, country music artists have never had a big problem drawing a crowd to music venues of all sizes in Charlotte. Yet for all that stereotypical love of pickup trucks, cowboy boots and trailer park tales, the Queen City lacks a solid country music foundation to build from on the local level. We've had performers over the years — from traditionalists like the Loose Lugnuts to alt- versions like Lou Ford to newer acts like Gal Friday Band and Taylor Centers — but our fine city has yet to nurture a country artist from humble beginnings. Please notice I said, "yet." With a perfect storm of sorts brewing in Charlotte these days, perhaps it's only a matter of time before we have a talented country artist the city can hang its hat on. There are a handful of artists making regional waves already, the number of country-influenced venues is steadily increasing and with the area's population growing at a steady pace, are all of the right factors in place? When country music is mentioned, most people's focus is directed toward Nashville. And, sure, there are plenty of artists who are based there, but it's not where many get their start. The Carter Family got its start in Virginia. Merle Haggard is from California. Willie Nelson is from Texas. Zac Brown and Lady Antebellum are from Georgia. Garth Brooks is from Oklahoma. And even North Carolina has had its share — Eric Church, Charlie Daniels and Randy Travis. Charlotte has had a string of country artists over the years and while some have undoubtedly relocated, there are others with their feet planted firmly in the area. There's country-rock artists like Early Ray and Taylor Centers, bluegrass-infused groups like Gal Friday Band, traditional outfits like the Loose Lugnuts and modern-leaning bands like Pharr Rhoades. Most of the artists we spoke with agree Charlotte is a tough market — for bands of any genre. They feel that, too often, people only latch onto an artist after they've been told it's good by television, radio or the movies. That Charlotteans are afraid to take risks and check out bands they've never heard of. It makes building a fan base that much more difficult, but not impossible. If people are fans of country music, and know there are venues dedicated to it, that's one hurdle cleared right off the bat. More on that, later. "People will pack it out when Kenny Chesney or even Chris Stapleton comes to town, but I don't see those people on a regular basis," Brian Wilson, drummer for the Loose Lugnuts and co-owner of the Thirsty Beaver Saloon, says. If people don't support nationals on the rise, what chance do locals have? Well, for starters, they're local. When someone from your hometown hits the national spotlight, there's pride involved. There's bragging rights to saying, "I saw them when they were playing for 15 people..." and "they're from my town." Locals like Centers, Early Ray and Gal Friday Band have been making rounds on the festival circuit. Both played the recent Carolina Country Music Festival in Myrtle Beach which also featured Rascal Flatts, Eric Church, Hunter Hayes, Big & Rich and more. "Our favorite fans are festival fans," singer Melissa York of GFB says. "They stick. Most folks who come out and see us at festivals remember our name, follow our social media and will buy CDs and merch. They just seem to be more supportive. Charlotte has to decide — is this going to be a town that only celebrates fame or is it going to be a town that gets behind their local talent and supports them on that road to the big stage?" Wilson suggests the best way to get a country band going in Charlotte is to not care what people think. You have to be motivated to play no matter what. Centers had a recent conversation with someone in her camp about a potential move to Nashville. She was told, "Why move to Nashville where you're one of a million other country singer/songwriters? Stay in Charlotte where you're one of a handful and can really make your mark." It's solid advice — as long as Charlotte decides it wants more country music and is going to support the original artists who are trying to make it happen. And, while that's not easy, it does appear to be getting better. For a long time, the question was, "Where are we going to play?" These days, there are a lot more answers to that question. As we talked to different musicians, promoters and venue owners about Charlotte's country music scene, we often heard the same comment — "We need another country venue in town to help support it." If you look around, however, there's plenty here for every step of the way. From the ground floor to a larger capacity venue, if you look at the staples of Charlotte's country-leaning venues, there's the Thirsty Beaver in Plaza Midwood and Puckett's Farm Equipment in Derita (each with capacities under 100), Tin Roof at the Epicentre (210), Bootlegger's Saloon & Dance Hall at the N.C. Music Factory (800) and Coyote Joe's on Wilkinson Boulevard (3,000). Of course, there are plenty of other locations that fit near and between those numbers for one-off performances, but there are enough venues in town to create a circuit of sorts for developing artists who want to start at a small bar and work their way up through the ranks as a headliner and/or opening act. And people will show up — as evidenced by sold-out country concerts at the area's biggest venues — Uptown Amphitheatre, Time Warner Cable Arena, PNC Music Pavilion, etc. Charlotte's even gotten better about catching artists on their way up. Sturgill Simpson sold out the Chop Shop, Chris Stapleton played to a packed house at Amos' Southend and plenty of artists have left their mark at Coyote Joe's over the course of that venue's 24-year history — from Brooks and Dunn to Florida-Georgia Line to Justin Moore. "When Sturgill Simpson played the bar years ago, hardly anybody showed up. This was two years before he played at the Chop Shop. We kept trying to tell people he was good," Brian Wilson of the Thirsty Beaver says. Most locals have had to play wherever they can get a gig — the Evening Muse, Neighborhood Theatre, Double Door Inn, Comet Grill, etc. But with a growing lineup of country-focused music venues, Charlotte could be headed in the right direction to develop artists right here at home. And there have been regular events to help keep interest going as well. Snug Harbor used to have Country Tuesdays. Although that regular series ended after a decade going strong, one of its organizers, Corey Zeigler, says he'll still do events when he can. Thirsty Beaver tries to have a country artist perform every Sunday afternoon. Centers is hoping to start a songwriter night at the Evening Muse. "Pairing a talented local act with a national act helps everyone and encourages folks to support local talent," York of Gal Friday Band says. "(We need) authentic venues willing to showcase fresh new artists." The good news is that both of the larger country venues aren't afraid to showcase local talent. 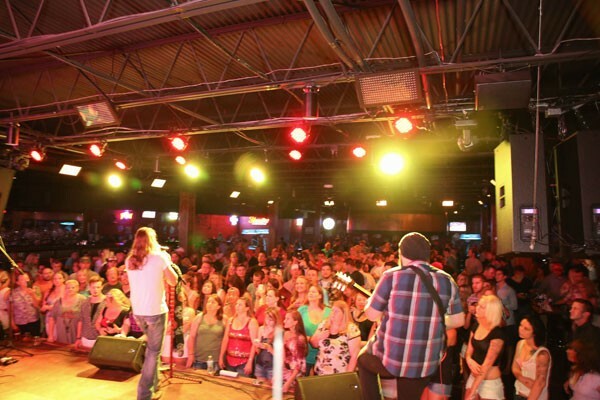 Coyote Joe's has regularly put artists like Early Ray and Salisbury's Darrell Harwood on their stage. Bootlegger's, which opened roughly two months ago, is also making it a point to support the local talent with recent/upcoming shows by Dixie Still, Dirty Grass Soul and Pharr Rhoades. While Coyote Joe's wants people to know they're constantly evolving to present new and upcoming artists as they've done for 24 years, Bootlegger's just wants people to know they're in town. They refurbished the former home of the country bar Saddle Up and are focused on being a live music venue, having put in a stage and the necessary audio equipment to go along with it. "We're doing a lot of new country, country-rock and crossover country," Bootlegger's owner Aaron Gunn says. "We want to help people discover some of the local talent that's here — because it is here." Meanwhile, Wilson and his brother, Mark, who co-own the Beaver have plans to open a restaurant on 7th Street in the near future. While that won't be a "music venue" they do hope to have charity events and benefits that can focus on country music from time to time. So, all of the stepping stones are falling into place. The music is here. The venues are here. One can only hope that as the summer concert season fades out, any momentum from the big acts coming through will stick around and continue to develop into a respectable scene. Look, Charlotte's never going to be Nashville, but it doesn't need to be. No one says Charlotte has to be known for one genre or artist either. Just as all of the elements are in place for a country scene to thrive here if the people will support it, so could a hip-hop scene or jazz scene or anything else people might find lacking. The next musician to put Charlotte on the map is probably grabbing a microphone or guitar right now.